Since the Law Enforcement Alliance of America (LEAA) first drafted “National Concealed Carry for Cops” twelve years ago, we have fought tirelessly to see this law bring much-needed protection to police officers, their families and our communities. The Senate voted to pass H.R. 218 the ‘National Concealed Carry for Cops’ legislation that was passed by the House on June 23rd. 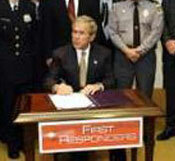 The bill now goes to President Bush, who has indicated his strong support for the legislation. The ‘National Concealed Carry for Cops’ law gives qualified off duty and retired law enforcement officers the ability to carry their firearms concealed nationwide. In 1992, the Law Enforcement Alliance of America (LEAA) and Congressman Randy “Duke” Cunningham came together to promote common sense. LEAA and Congressman Cunningham believed that qualified off duty and retired law enforcement officers ought to have the tools to match their training whether they are traveling out of state, or retired. America’s men and women in blue deserved the right to protect themselves and their families from threats that didn’t go away at the state line and criminal grudges that didn’t end at the officer’s retirement party. When Congressman Cunningham and LEAA first gathered at a press conference to announce the ‘National Concealed Carry for Cops’ bill, the House and Senate were controlled by Democrats and President George H.W. Bush was in the White House. The bill only gathered 15 cosponsors that year, a far cry from the 297 in the House and 70 in the Senate of today. But Congressman Cunningham and LEAA kept at their support for this common sense idea, and together they worked to promote the legislation in every session of Congress for the next 12 years. Along the way, the ‘National Concealed Carry for Cops’ bill picked up tremendous grassroots support. Rank and file officers from across the country began writing their elected officials. The law enforcement community began to take notice of the issue, with articles about the bill’s importance appearing in police publications across the country. LEAA Life Member and noted law enforcement training expert, Ed Nowicki testified before Congress about the merits of this life-saving legislation. By 1997, five years had passed and LEAA’s support of ‘National Concealed Carry for Cops’ was joined by many more Members of Congress, as well as numerous local, state and national police organizations. Some of the largest organizations in America’s law enforcement community, including labor organizations joined in support. The bill became commonly known as H.R. 218, after the same bill number it had been assigned in several congressional sessions. H.R. 218 was now backed by many law enforcement groups. LEAA’s legislative staff worked with local law enforcement groups across the country to compile official letters of support from as many Congressional Districts as possible. A bi-partisan backing emerged as ‘National Concealed Carry for Cops’ gained support from significant numbers of Republican and Democrat Members of Congress. Anti-gun politicians have been the biggest hurdle for ‘National Concealed Carry for Cops’. In 1998, the bill makes it through the House Judiciary Committee, but anti-gun opponents hold a press conference attacking ‘National Concealed Carry’ for Cops after the concealed carry provisions are expanded in committee. Early this year ‘National Concealed Carry for Cops’ was on the verge of Senate passage, until anti-gun amendments blocked the bill. Some of America’s most noted anti-gun politicians have blasted the legislation, such as Massachusetts Senator Ted Kennedy, who spoke on the record about his fears of retired police officers carrying concealed “sniper rifles”. Another anti-gun politician from Massachusetts said he needed more reassurance that retired officers wouldn’t be allowed to carry concealed “grenades”. It soon became clear that when it comes to promoting gun control, many politicians have no problem restricting even law enforcement officers from having firearms. After being held up for years in the House Judiciary Committee, ‘National Concealed Carry for Cops’ finally got a fair hearing and a vote. Not surprisingly, the bill passed overwhelmingly, even over the objections of the Committee Chairman and the Ranking Minority Member. The full House took up the bill on Wednesday, June 23rd, 2004 and it passed in a voice vote. LEAA hosted a press conference with Congressman Cunningham, other members of Congress and leaders of national law enforcement organizations. 12 years after the first press conference LEAA Executive Director and Congressman Duke Cunningham were on the verge of victory in their 12 year fight on behalf of America’s law enforcement community. The Senate took prompt action and the bill was passed on July 7th in a unanimous consent agreement. Special recognition is given to the Law Enforcement Alliance of America for their leadership in the passage of this historic legislation. Click HERE for the Law and its Amendments.